This article is based on the presentation I gave at ECOMM 2018, VeloFinland 2018 and Ekocentrum Gothenburg. See also the poster. If you’d rather listen to the audio recorded in Gothenburg, here’s a video with slides. Road safety – intrinsic value? Cycling is a solution to many things: health, pollution, noise, congestion, equality, accessibility and environmental issues. That’s why I want to promote cycling. But there is an issue that keeps coming in the way: Safety. It seems to be very difficult to talk about safety. People are very emotional about it. People take it very personally. Everyone has an opinion on it. Someone had a personal tragedy, etc. Concerns about safety is one of the reasons why more people are not cycling. That’s why I wanted to learn what safety is really about, and understand how people see it and why. This article is about what I found. Its an analysis of safety. It’s one way of seeing it. It’s how I see it. I don’t want you to believe what I’m about to say. I want you to think what I’m about to say. My examples are from Finland, but if you don’t live in Finland I’m sure you can think of similar examples from your own country, and consider which part of this analysis apply to your country and which doesn’t. When you hear the word road safety, what comes to your mind? Perhaps street design, speed limits, helmets or safety campaigns. Road safety can mean a lot of things. And we get easily mixed up with all these things. Often when we are talking about road safety, we are actually talking about something else, like morality. But if we want to improve road safety, that is, to reduce collisions, injuries and deaths, we must separate feelings from facts. To do this I use the concepts of cultural safety and actual safety. All this appeals to our emotions. Actual safety is what actually is safe or dangerous according to accident and injury rates. It is a mathematical concept. It is defined by the laws of physics: what actually causes destruction in traffic is mass and speed. From the real world data we can determine how dangerous something is, or if a safety measure has any noticeable effect. Actual safety is described by numbers – emotions and feelings have nothing to do with it. Putting our energy into cultural safety will not help us meet the road safety targets. We must focus on actual safety. In order to do this, we must ruthlessly examine our blind spots regarding cultural safety. There might be something that is very precious to us and that we stubbornly hold on to. 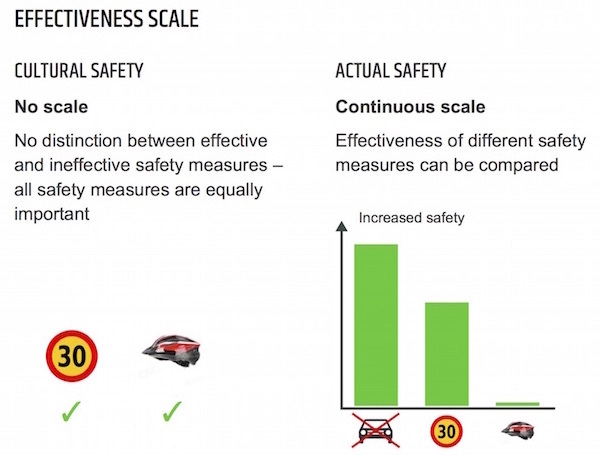 We must ask: Does this safety measure really reduce collision and injury rates? Is there any evidence that it does? Or is it just to make me feel better? Or to make my driving easier? But easier driving does not mean safer driving. We should ask what justification there is for traffic safety to be an intrinsic value. What about other values like health? Sometimes road safety conflicts with health. Why should one life in road accidents be more valuable than five lives in cardiovascular diseases? We should also consider the implications of our demands for safety, for example safety vests. The ultimate goal of traffic safety agencies? Is this what we want? If not, then how many people should wear a safety vest, who should they be and why? I don’t think they really thought this through. 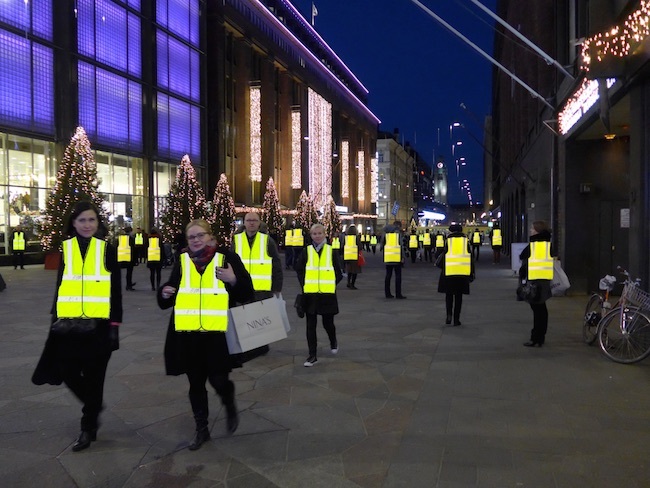 A pedestrian reflector is something we use in Finland and in Sweden. It is a small reflector you attach to your clothes. It’s supposed to blink and make you more visible and safe. In Finland we just love the pedestrian reflector. It is a Finnish invention, so it must be effective! If only everyone would wear one! Cheap, small, simple solution to road safety. Except that it turns out, it doesn’t really solve the problem. Source: Onnettomuustietoinstituutti, VALT- and OTI-reports. 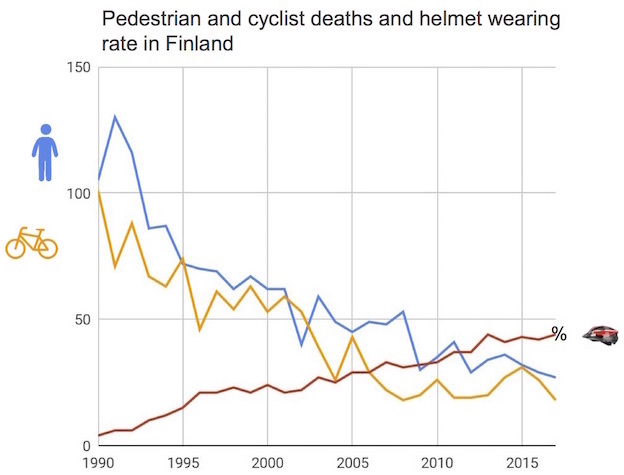 During 7 years 221 pedestrians died in Finland. In 10% of the cases there was a theoretical possibility that the pedestrian might have survived if they had worn a reflector. In 90% of the cases there was no evidence or it was clear that a reflector would not have made a difference. 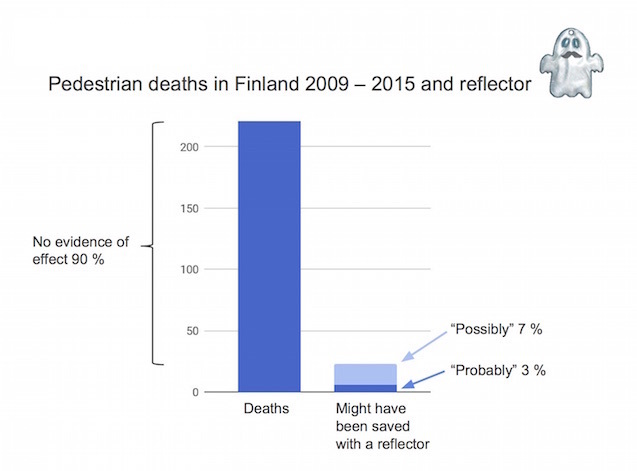 But still, in Finland the reflector is commonly viewed as the most important safety thing for pedestrians. What’s the harm in wearing a reflector, you might ask. No harm. I sometimes wear one. But should we put lots of effort in promoting it? The problem is, when we aggressively promote for personal protective equipments like pedestrian reflectors and bicycle helmets, we forget that they don’t really improve our safety that much. They get much more importance than they should, and so we are not addressing the real safety issues. But if it saves one life, it’s worth it. Right? But is it really? And what price do we pay for this one life saved in traffic? Sources: Physical inactivity. Air pollution. Cyclist deaths: Tilastokeskus. Helmet estimates: Onnettomuustietoinstituutti VALT- and OTI-reports. Cambridge university scientists estimated that 7,5% of all premature deaths in Europe are due to physical inactivity. In Finland this means 4000 people every year. Air pollution kills another 4000 people. About 20 people die in cycling collisions. And about 2-3 people a year might be saved if all cyclists wore bicycle helmets. We know that bicycle helmet laws deter people from cycling. Even just promoting bicycle helmets deter people from cycling, because it makes cycling seem a dangerous activity. 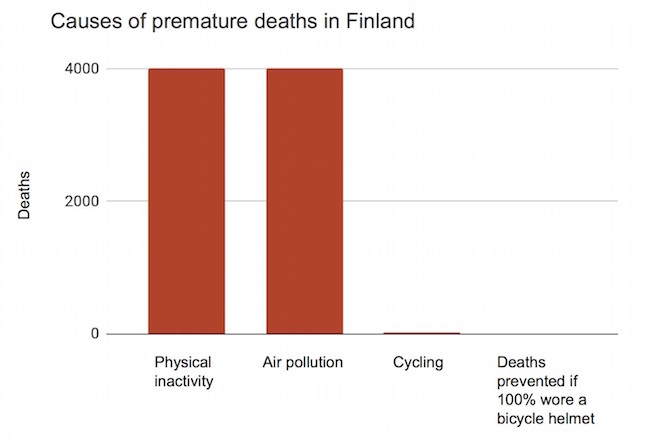 But more cycling is a solution to the physical inactivity problem. 4000 deaths a year just in one country. We really should get more people cycling, not frighten them from cycling. Of course we should also address the cycling deaths. But not at the expense of the physical inactivity problem. There’s no point in paying for one life with many lives. We think we are rational. Bad news, we are not rational. Because we are humans. Scientists of California University made a study, where they asked people, how much in danger a child was when left alone for some period of time. People consistently estimated the risk to be higher, when the child was left alone for a morally unacceptable reason, like the parent meeting a lover, than when the child was left alone for a morally acceptable reason, like the parent getting into an accident. Even though in both scenarios everything else was identical, and the actual risk to the child was exactly the same. Intentional actions were seen as more harmful than unintentional actions. You know that car driver who doesn’t look at your direction, almost runs you over and then casually say: ”Sorry mate, I didn’t see you.” As if it wasn’t dangerous, because they didn’t mean to do it. There are also other studies with consistent results: Moral judgements distort our perception of risk. We confuse morality with risk. First we make a moral judgement on emotional basis. And then we rationalize it to ourselves by saying that it’s about safety. Often when people think they are judging the danger, they are actually imposing a moral judgment on someone. We unconsciously think that it’s not only wrong because it’s risky, it’s also risky because it’s wrong. In Finland it’s against the law to cycle on a pavement. It’s our national hobby to moralise those bad people who cycle on a pavement. It’s so dangerous! But the funny thing is, a sidewalk and a joint cycle path and sidewalk often look exactly the same. This place used to be a sidewalk before they made it a joint cycle path and sidewalk just with a traffic sign. No other changes were made. 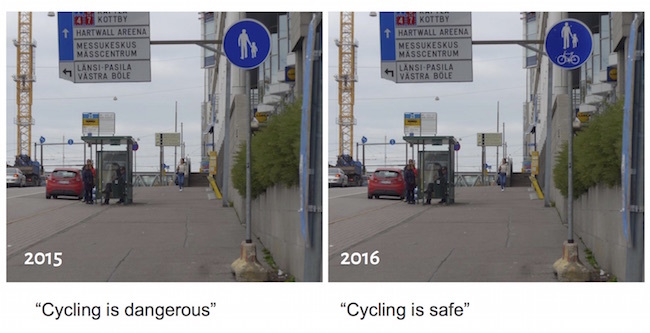 So on the left picture cycling is illegal and therefore dangerous, whereas on the right picture cycling is legal and therefore safe. The traffic sign magically makes it safe to cycle on. If you look at the statistics, pavement cycling isn’t that dangerous. But it’s illegal and therefore morally wrong. People are irritated by it, so they feel it’s dangerous. Because cultural safety isn’t about actual risk, it only has two risk levels: safe and dangerous. Follow the speed limit, it’s safe. Exceed it, it’s dangerous. Risk levels can’t be compared, because they are all the same. But in reality risk increases continuously with speed, regardless of the speed limit. Different activities have different risk levels. And different risk levels can be compared. In cultural safety it’s dangerous to cycle without a helmet, and safe to cycle with a helmet. But in reality speed is a much more significant risk factor. Dropping your cycling speed from 30 km/h to 20 km/h increases your safety much more than wearing a bicycle helmet, already because speed affects your risk of getting into an accident in the first place, whereas a helmet doesn’t prevent any accidents, it only softens the impact, and it only covers part of your head. This image is for demonstration, not based on actual numbers. 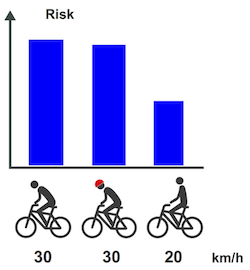 It is safer to cycle 20 km/h without a helmet than 30 km/h wearing a helmet. Because cultural safety doesn’t differentiate risk levels, we cannot have a conversation about how dangerous something is. Nor can we compare the effectiveness of different safety measures – in the context of cultural safety all safety measures are equally important. But in reality not all safety measures are equally important. Some of them increase safety significantly, like removing cars or lowering their speed. Some of them increase safety only marginally, like bicycle helmets. We need to really understand this if we want the accident rates to go down. Green chart is for demonstration, not based on actual numbers. A bicycle and a rider weighs about 80 kg and moves about 20 km/h. A car weighs about 1500 kg and moves about 50 km/h. The kinetic energy of a car is roughly 100 times greater than the kinetic energy of a bicycle and a rider. The car poses the greatest risk in traffic, especially to people outside the car. 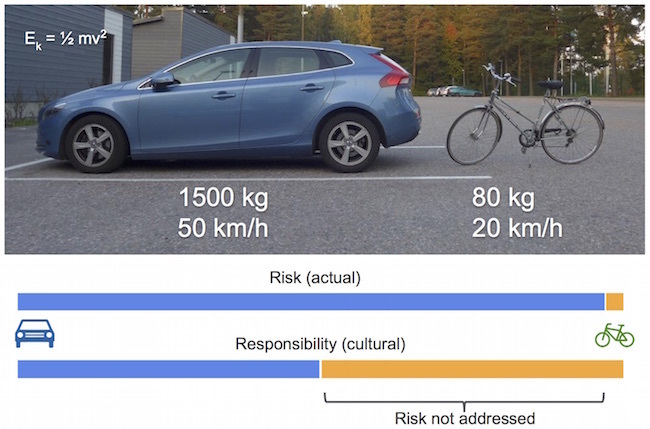 But because cultural safety doesn’t differentiate between risk levels, the responsibility of the risk of the car is distributed equally among all road users – also to those who do not have the power to diminish that risk. This means that a big part of the risk is not addressed at all. Often when we do something about safety, it’s not really because of safety, but because the society tells us to do so. Safety ritual is a safety measure that has little or no effect on accident and injury rates. When it’s not about safety, it could be about doing the right thing. For example, a pedestrian standing at an empty crossing waiting for a green light. It could be about being accepted or being responsible. 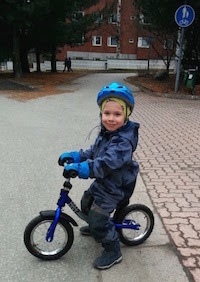 For example, a kid riding a kick bike at walking speed, not very dangerous. But if you don’t put a bicycle helmet on his head, you are being a bad parent, and you will be disapproved by other parents. It could be about personal gain. It makes my driving easier if all the pedestrians are dressed as a christmas tree. I don’t have to pay so much attention. Cultural safety is usually carried out by requiring behavior change from individuals. This is done with road safety campaigns and promoting personal protective equipments like helmets and reflectors. Actual safety is carried out by structural changes, like car-free areas, lower speeds or other proven effective safety measures. You might have seen this triangle before. 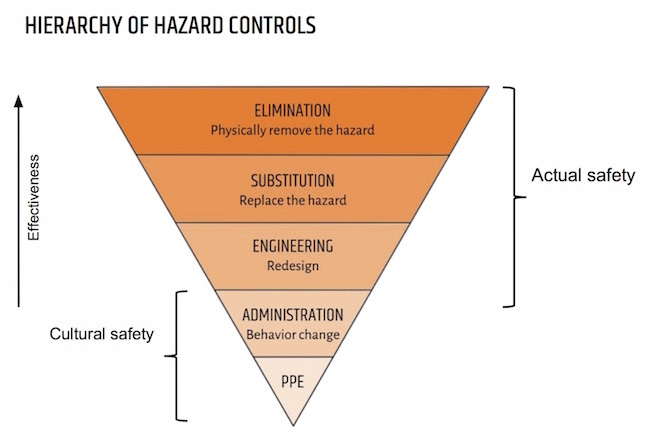 It is the hierarchy of hazard controls. On the top are the primary and the most effective hazard controls: removing the danger, replacing the danger with something less dangerous, and engineering, like redesigning the street so that it’s impossible to drive very fast. Below are the last and the least effective hazard controls: Regulations, safety campaigns and personal protective equipments, like bicycle helmets and safety vests. They are the last resort, if nothing else can be done. Actual safety concentrates on the most effective hazard controls and cultural safety on the least effective hazard controls. There is a whole organisation in Finland whose main mission is to promote only behavior change and personal protective ecquipments. And they have a 6,9 million euro budget from the government. Our goal is to get the accident rates down, and we already know how to do that: restrict car traffic or at least reduce their speeds. So why aren’t we doing just that already? Why are we wasting our energy on cultural safety? Cultural safety doesn’t really do anything. Except for one thing: It maintains the status quo. And what’s the status quo? The dominance of the car. Cultural safety is a show, a staging that says: Look, we are doing something about safety! 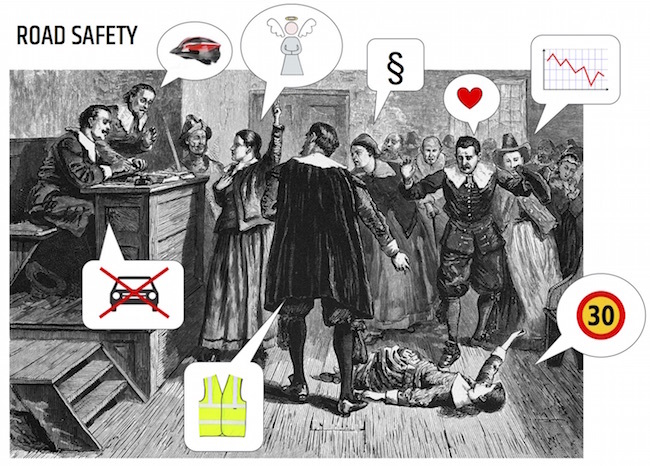 Why do traffic safety agencies concentrate on cultural safety? Because they are ruled by driving associations and car lobby groups. They have a conflict of interest. Practicing actual safety would mean restricting car traffic. They don’t want to do that. So they are not promoting safety, but they are promoting safety on a condition that the car traffic will not be affected. This means they cannot do anything effective. 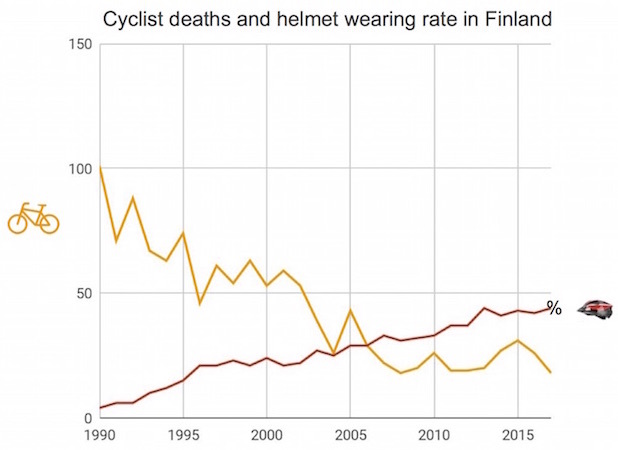 A Finnish driving association gave a statement on the bicycle helmet law in Finland. They said that the law should not be repealed. Why on earth would a driving association have any interest in bicycle helmets? Because bicycle helmets serve cultural safety. They maintain the status quo of the car. With the help of bicycle helmets safety will be dealt with, without actually changing anything. It seems that bicycle helmets also miraculously prevent pedestrians from dying. Or not. Most likely overall road safety has improved, also for car drivers, mainly because of lower speed limits. There is no real world evidence that bicycle helmets reduce death or injury rates. And I’m talking about real world injury rates. Not case-control studies that produce at their best a theoretical guess for the effectiveness of bicycle helmets. Some of these case-control studies have estimated a huge effectiveness for bicycle helmets, and from some of them can even be concluded that helmets reduce arm and leg injuries. But the main point here is this: If bicycle helmets really were effective, we should see a clear reduction in the real world injury rates because of bicycle helmets, and no evidence of this has been found. * I’d like you to stop and think about this for a moment. Reducing the real world injuries is what matters. No evidence doesn’t mean there wouldn’t be any effect. There may be an effect, but it may simply be so insignificant it can’t be detected. Despite the lack of real world evidence, and despite the fact that already according to the hierarchy of hazard controls bicycle helmets are the least effective safety measure for cycling, they are considered to be “very important”. Cultural safety is about ideology, morality and conservatism. Actual safety is about measurable accident, injury and death rates. *) This has actually been studied (see also this interesting alpine skiing helmet study), even though the burden of proof lies with the one that claims that helmets are an effective safety measure. Please read and learn about case-control and other study methods before starting to debate about them with me. It is a profound subject and there’s no point in debating without solid understanding of these study methods.